With its slick, black blade and fearsome dragon detailing, this handmade katana looks like a weapon to be reckoned with. The Black Blade Dragon Katana is made in a traditional samurai style, with a thin, curved blade and ornate tsuba, or guard. 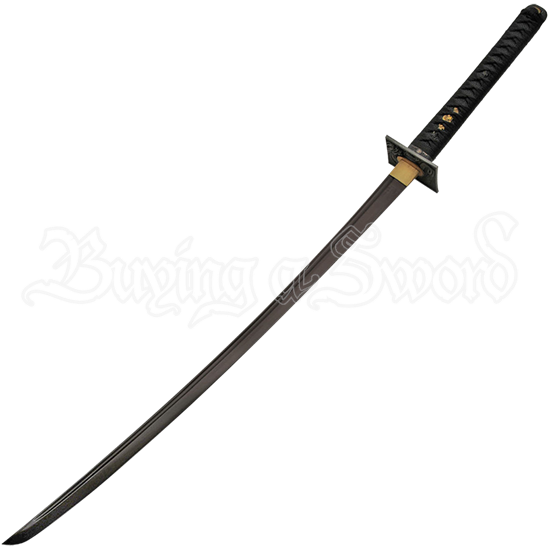 The blade is made of carbon steel with a blackened finish and a fuller along most of its length. The square tsuba is black metal and has an ornate, raised dragon design. It surrounds the base of the brass blade collar, after which is the black faux rayskin handle and gold tone menuki, or palm ornamentation. Black cord is wrapped over the textured handle in a traditional katana style. Safely store the steel blade in the included black scabbard. Beautiful, highly detailed, and very traditional in its appearance, this handmade samurai katana is ideal for adding the style of ancient Japan to any weapons collection or display. A black cloth cover that fits over both scabbard and sword is also included for protective storage.